The University is aware of the reports from the NFL Draft regarding Laremy Tunsil and potential NCAA violations during his time at Ole Miss. Like we do whenever an allegation is brought to our attention or a potential violation is self-discovered, we will aggressively investigate and fully cooperate with the NCAA and the SEC. One of the other parties to the NCAA Notice of Allegations has requested and received a 30-day extension to respond to the notice. This extension is an often used tool available to all parties, and the Notice of Allegations itself has not changed in any way. Upon the completion of the 30-day extension period, the University will release our full Response to the Notice of Allegations. 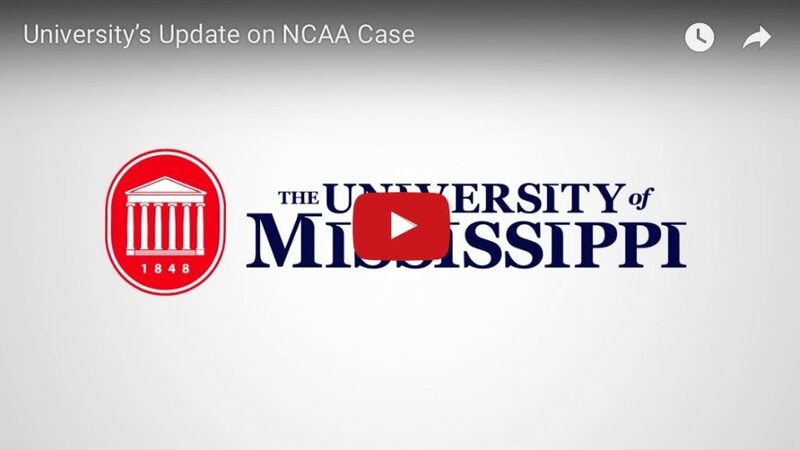 Outside counsel for the University of Mississippi received a Notice of Allegations from the NCAA – another step in a more than three-year process. Included in the notice are alleged violations of NCAA bylaws in women’s basketball in 2012; track and field in 2012-13; and in football, with many of the allegations dating back to the former football staff in 2010 and the withholding and reinstatement process around Laremy Tunsil in fall of 2015. To be clear, the NCAA has only brought allegations, and as part of the NCAA process, the University and others have 90 days to issue a response. We’ve been transparent throughout this process, and it is important to note that most of the football allegations are based upon facts that have been publicly disclosed previously in “self-reports” and reinstatement requests or have been reported publicly in connection with another NCAA case. Out of fairness to the individuals involved and the integrity of the NCAA process, we will not provide further details or comment until everyone has had an opportunity to review the allegations and respond. Once they do so, we will release the official notice and the university’s response. In all three sports, I am confident in the leadership of our current head coaches and the manner in which they operate their programs. OXFORD, Miss. — On Monday afternoon, the University of Mississippi was notified by the NCAA that Laremy Tunsil will be suspended for a total of seven games and will return to competition on October 24. The University initially withheld Tunsil from competition at the start of the season as both the NCAA and the University examined several alleged improper benefits. During the course of the process, it was determined by the NCAA that Tunsil received impermissible extra benefits that included the use of three separate loaner vehicles over a sixth-month period without payment, a four-month interest-free promissory note on a $3,000 down payment for purchasing a used vehicle, two nights of lodging at a local home, an airline ticket purchased by a friend of a teammate, and one day use of a rental vehicle. In addition, it was determined that Tunsil was not completely forthcoming when initially questioned by NCAA investigators regarding the loaner vehicles. He later corrected his account and since apologized. As part of his reinstatement conditions, the NCAA imposed a seven-game suspension, ordered Tunsil to pay the value of the extra benefits to a charity, perform community service, and he will also make the vehicle down payment. Statement from Laremy Tunsil: I take full responsibility for the mistakes I made and want to thank everyone for their continued support. I want to apologize to my teammates, coaches and the entire Ole Miss family for how my choices affected our program. This was a learning experience, and I’m looking forward to being back on the field with my team and redeeming myself. The last 10 months have been a physical and mental battle for me, but I love playing this game more than anything else. I want to be here for my teammates who are depending on me to finish what we started together. Statement from Hugh Freeze: We have been supportive of Laremy throughout this process, and we are thankful he can return to competition starting with the Texas A&M game. More important than his football ability is his character, and I am confident that Laremy will grow from this experience and continue to be a positive member of the University and our football team. We have been preparing as if Laremy Tunsil will not play and that status will continue until the matter is resolved. The team of our university administration, athletics compliance and outside counsel are working daily on this sensitive matter. Although the process is ongoing, the decision to withhold Laremy is not related to any current items involving our football staff, and we have been assured that everyone is aggressively seeking a resolution. We continue to support Laremy in every way. In early July, the University offered (Laremy accepted) separate legal counsel with experience in similar matters, and the University continues to pay for Laremy’s counsel, as permitted by NCAA rules. As a precautionary measure, we are withholding Laremy Tunsil from today’s game until the pending process can be completed. We are cooperating fully with the NCAA and feel this is the best way to protect Laremy, our football program, and the University. The University of Mississippi Department of Athletics is aware of the allegations made by Laremy Tunsil’s stepfather regarding potential NCAA violations involving Laremy. As we do with any allegation, we initiated an internal investigation last week and have offered the NCAA our full cooperation. We take the obligations to the NCAA and SEC very seriously, and we will continue to educate, monitor and enforce all applicable rules. Any other reports are speculation until the process is complete. OXFORD, Miss.– The University of Mississippi announced today that women’s basketball head coach Adrian Wiggins will no longer serve as head coach and has been placed on administrative leave while an investigation continues over impermissible recruiting contacts and academic misconduct committed by members of his staff. These staff members, which include assistant coach Kenya Landers and director of basketball operations Michael Landers, have been terminated effective immediately. Wiggins hired the Landers couple six months ago shortly after he joined Ole Miss as its head women’s basketball coach. The allegations and findings that led the University to this decisive and swift action are now being further examined jointly by the University and the NCAA. “This is a sad day for the University of Mississippi, our profession and most importantly our student-athletes,” said Ross Bjork, Ole Miss Director of Athletics. “We are committed to the values of professional integrity and academic honesty found in the University Creed and the vision, purpose and core values we have established since I arrived at Ole Miss. We expect our staff and our student-athletes to promote and uphold our values, and I am extremely disappointed these events have occurred. The search begins immediately for an interim head coach for 2012-13, and a national search for a permanent head coach will be conducted at the conclusion of the season.